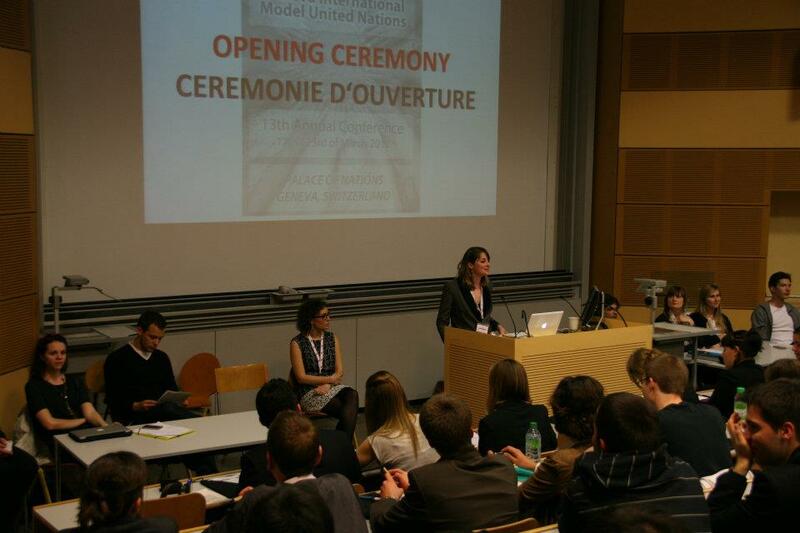 Opening ceremony of 2012 Geneva International Model UN conference in Switzerland. Photo by GIMUN. As we arrived in Geneva after hours on a stuffy plane, our sleepless night drifted away as we witnessed the beauty of the city. All of the hours of applying, preparing, lectures, writing papers, packing and traveling paid off — we were finally here. Registration at GIMUN was held at the University of Geneva where a student told me that it is the primary university of the city. While sitting in Opening Session for the conference later that afternoon, we began to notice something that we had never experienced before, being the minority. As the secretary general spoke and introduced her dais staff of under-secretary generals, we waited. They spoke eloquently and energetically, all in French. For many of us, we were used to conferences being entirely in English; we’d be able to pick up on those who it was their second language. Now, at this conference, we were the ones who needed the interpretation. The conference seems to be exciting and filled with the cultural diversity it wishes to achieve! This entry was posted in News, Student Delegate Blogs and tagged Geneva, Geneva International Model United Nations, GIMUN, Katie James, Model UN, Model United Nations, MUN, New York City, Pace University, Switzerland, University of Geneva. Bookmark the permalink.